These exceptional quality wide leg slacks are handmade by one of the finest clothiers, Pronti. 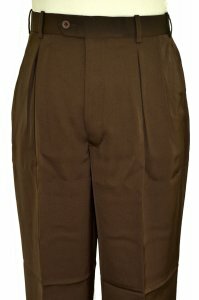 Pronti offers fashionable dress slacks that are completely hand tailored with a double pleat, on seam pocket and back besom pocket with button. These dress slacks are a classic that can be worn to any occasion as well as any time of the year.